In this film a community fights for the freedom of the Niger Delta which makes foreign companies large sums of money from its oil resources. Because of the mining for oil the environment in and around the delta is being destroyed and the community is being harmed, unable to live off the land and its fishing profits. The community uprises against the oil company and its government which yields a large amount of violence and deaths. The Nigerian people must rely on themselves and the strength of one another in order to fight for the land that rightfully belongs to them. Kogbara, Donu, and Belinda Otas. 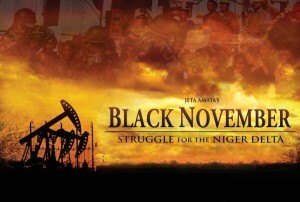 "Black November: Niger Delta film spills powerful story." The Africa Report. The Africa Report, 29 Aug. 2012. Web. 18 Nov. 2013. Phil Hoad. "Is Jeta Amata Nollywood's gift to Hollywood?" The Guardian. Guardian News and Media Limited, 1 Feb. 2012. Web. 18 Nov. 2013. Sesay, Isha, and Jessica Ellis. "'I am Nollywood': Director's tale of Niger Delta struggle." CNN Entertainment. CNN, 29 Mar. 2013. Web. 18 Nov. 2013.